Today, we are excited to announce the addition of two new sharing services, WhatsApp and SMS Client to all Shareaholic Share Buttons, ready and optimized for your mobile visitors. We’ve said it before: mobile is king, and more than ever, having the most relevant sharing tools available to your users across platforms is crucial to maximizing social shares. Now, you can add both WhatsApp and SMS share buttons to your site with just a simple click. Additionally, we’ve made them both “smart” buttons, ensuring they automatically only appear on mobile! As mobile sharing explodes, so has the use of personal messaging applications as powerful sharing engines, and the wildly popular upstart messaging service WhatsApp is on the front lines. In January 2015, WhatsApp was the most popular messaging app globally with more than 700 million active users. In April 2015, WhatsApp reached 800 million active users. WhatsApp has proven its value as one of the most actively used, and most preferred of these platforms. Similar to WhatsApp, the use of SMS client (includes Apple’s iMessage) as a sharing service continues to grow as a powerful way for visitors to share your content across their personal networks. 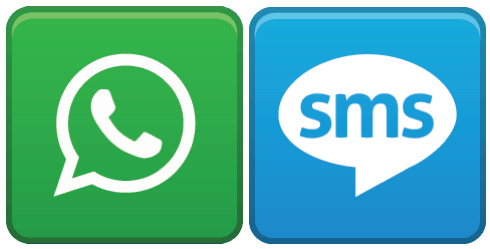 Summary: Enable WhatsApp and SMS immediately! If you have any questions on how to add these new services to your Share Buttons line up, please don’t hesitate to reach out to our support team who can be reached at support@shareaholic.com or via twitter @Shareaholic. And of course, we encourage you to visit our Helpdesk for all of the relevant Share Button Help Documentation.